Timberland Flyroam Go Leather Chukka Sneakers has just been released by Timberland. Our experts are working on a detailed review. Please, come back later. Way back in 1952, half an interest in The Abington Shoe Company was acquired by Nathan Swartz. Doing contract work for other industrialists was what the company’s first start out. Swartz then obtained the full interest in the company and clearly saw its probable capacities, and in 1955 he invested in for all the other shareholders. After a decade, The Abington Company developed a new technology for its footwear products which involved an injection-molding process. The production of virtually waterproof boots was then facilitated by this inventiveness. The products vary with both of the temperature difference between cold and warm. The company was then relocated to Newmarket, New Hampshire in 1969. It was later in 1973 that the company officially was named The Timberland Company. The high popularity of the waterproof boots was what led the company into these changes. Casual and boat shoes were then added to the product collection of the company around 1978-1979. During the 1990’s, the company continued their journey to expansion and added more product lines as they also expanded their influence in different regions of the globe. Firstly known for their waterproof boots, the company has started to produce lifestyle footwear that some are influenced by their traditional boot design. A wide variety of casual boots and sneaker boots are offered by Timberland which includes the Timberland FlyRoam Go Leather Chukka. The shoe is among the brand’s FlyRoam Collection, and it is offered for both men and women in various colorway choices. A stylish footwear that brings edge for a street-inspired look, the Timberland FlyRoam Go Leather Chukka delivers style and appeal for the wearer. The design of the high-top silhouette displays a rugged yet casually stylish image that fits well in the streets. 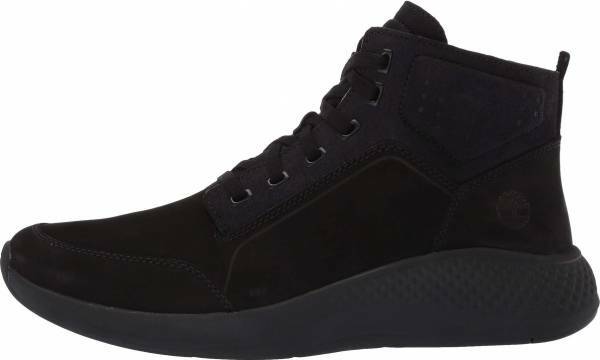 Versatility also comes with style when it comes to the Timberland FlyRoam Go Leather Chukka Sneaker as it offers a characteristic that complements different types of apparel combinations. One can wear the shoe in various occasions. An Aerocore energy system midsole compound is featured in the shoe, providing the wearer an enhanced cushioning system that keeps their foot in comfort. The Timberland FlyRoam Go Leather Chukka is available in both men’s and women’s sizing. Sizes ranging from size 7 US to size 12 US in both medium and wide widths are offered for men. The women’s sizing ranges from size 6 US to size 10 US including half sizes, and only medium width is available. The stylishly rugged design of the Timberland FlyRoam Go Leather Chukka brings out its whole appeal. The premium nubuck leather upper construction of the high-top silhouette, offers a clean image for the shoe, keeping it blending in with the trend. The design structure of the Timberland FlyRoam Go Leather Chukka differs for men’s and women’s version. The men’s and women’s version of the sneaker may differ in price. The Timberland FlyRoam Go Leather Chukka features the Defender Repellent Systems treatment which holds off water and oil-based spatter. Linings of the silhouette are breathable mesh which is developed from 50% PET – recycled plastic bottles. 34% of the shoe’s durable outsole is composed of recycled rubber.